It's late fall. The streets of New York are busy. I'm on a train from the city to the mid-west and things are better than they've ever been. I'm so glad we're featuring a new fiction piece by regular contributor Erik Martiny alongside K. Brattin's fiction debut and a very funny piece by Alisa Wolfe about a cat who may or may not be a painter. Poems in this edition include some fantastic work by Ariel Francisco about types of meditation, and Chen Chen's very different take on the alphabet poem in the context of exploring choices. Jim Johnstone's subtle work appears in Fjords for the first time. Jonathan Greenhause gets into some heavy-duty philosophy word play and Devon Walker-Domini takes us through the potential of individual identity. Mike Sagato's paintings on stainless steel and Nikolaus Legrady's four canvas painting feature strong technique. Rafael Fuchs' photograph of a young girl was taken when I was three years old and lived in Mississippi. Robin Richardson's drawing of two elephants is both comical and poignant. Jay Varner gives us a great essay. Our interviews with novelist Chris Belden and artist Noah Becker are the first of some very great interviews we have coming out next year. 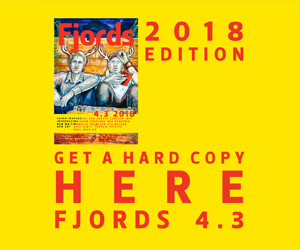 It's a lot of work to run a magazine like Fjords and our small staff continues to ensure we are widely available as well as pushing the envelope in terms of creative work and we're just getting started.